Coloring or creating mandalas or circular patterns is part of quite a few religious and spiritual traditions. Many of us think first of Tibetan Buddhism, but but similar circle patterns appear in the Navajo and Aztec traditions, Taoism, and even Christianity. Why does it resonate so? 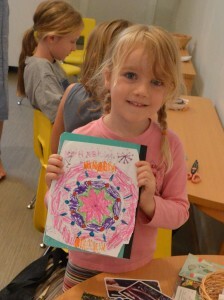 Without fail, our students of all ages love coloring mandalas. The activity is relaxing and focusing, and provides a great opportunity for discussions with older children (they tend to be less self conscious about participating in a discussion while coloring). This a recent article on the Huffington Post talks about the physiological benefits of the practice. One of the primary things we are teaching in children’s yoga is tools for the students to trigger their own relaxation response and find a meditative state. Coloring mandalas is only one age-appropriate way that we do that, but it’s also one that’s easy for parents to implement at home. Cancelled due to low enrollment. Tot Yoga (crawling-24 months) classes are engaging and fun. Class incorporates age-appropriate yoga poses, dance and creative movement, songs, stories, and games as children learn yoga through social interaction, repetition,… Continue Reading Coloring in Yoga Class: What is a Mandala? Little Family Yoga (21 months-4 years, with younger siblings welcome) classes are engaging and fun. Class incorporates age-appropriate yoga poses, dance and creative movement, songs, stories, and games as children learn yoga through social interaction,… Continue Reading Coloring in Yoga Class: What is a Mandala? This class for newborn to precrawling babies and their grownup(s) contains dozens of yoga-inspired movements, postures, songs, rhymes and activities designed to support baby’s development. Each class is filled with calming, nurturing ways to enhance… Continue Reading Coloring in Yoga Class: What is a Mandala? To be rescheduled as an evening workshop Whether working from home, at the office, full- or part-time, parents have questions about how to manage the transition back to the work world after baby, including… Continue Reading Coloring in Yoga Class: What is a Mandala? In this all-level yoga class, moms will cultivate the flexibility, concentration and strength needed during the transformative time of pregnancy and childbirth. Enjoy the community of other expecting mothers while we practice modified yoga postures,… Continue Reading Coloring in Yoga Class: What is a Mandala? Tot Yoga (crawling-24 months) classes are engaging and fun. Class incorporates age-appropriate yoga poses, dance and creative movement, songs, stories, and games as children learn yoga through social interaction, repetition, and play. 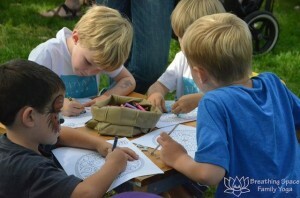 We encourage each… Continue Reading Coloring in Yoga Class: What is a Mandala? Toddler Family Yoga (walking-3 years) classes are engaging and fun. Class incorporates age-appropriate yoga poses, dance and creative movement, songs, stories, and games as children learn yoga through social interaction, repetition, and play. 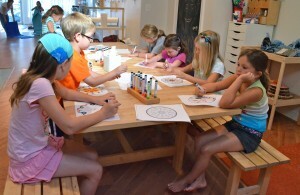 Yoga can help… Continue Reading Coloring in Yoga Class: What is a Mandala? Little Family Yoga (21 months-4 years, with younger or older siblings through 5 yrs welcome) classes are engaging and fun. Class incorporates age-appropriate yoga poses, dance and creative movement, songs, stories, and games as children… Continue Reading Coloring in Yoga Class: What is a Mandala?